Question: Tell us about the attacks on im- migrant rights by the Trump administration. there are current laws — such as the Truth Act — that stall the deportation machine and make it more difficult to deport our people. We’re a step ahead. Luisa: There are new attacks on immigrants every day. It’s outrageous! In Seattle, Los Angeles and other cities, undocumented immigrants are being detained and deported without cause; many have lived in the U.S. for 25 years or more. Sanctuary cities are being targeted and threatened with a cut in federal funding if protections granted to immigrants are not removed. Also, San Francisco and other cities, despite the threats, are not backing off in their commitment to Sanctuary City and the defense of undocumented immigrants. This is because we are organized. We’ve also just learned that the administration is working to broaden fast-track deportation. Trump has pledged to deport an additional 3 million people, just in the short term — on top of the 3 million already deported by Obama. And Trump wants to bring back S-Comm, so-called Secure Communities. This is the program that enables the collaboration between ICE and local law enforcement. It’s a long list. But we know that a big battle is coming. Trump wants to make an example of the Bay Area, which is why the trainings and Sanctuary Cities have to reach more unionists and community activists, and why we need to expand these trainings to other states across the country — and fast. We need to build a nationwide movement of resistance. 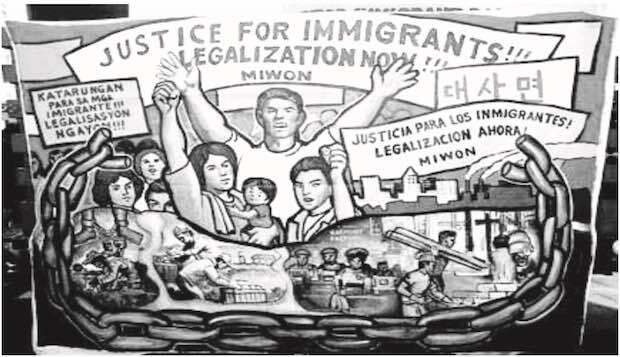 Question: What are immigrant rights activists in the San Francisco Bay Area doing to organize and resist? Luisa: Coalitions are meeting and planning actions for May First. Everyone understands that May First must be huge, and it must have a real impact all across the country, as much as, or more than, May First 2006, when millions of people took to the streets nationwide to protest the Sensenbrenner Bill. Luisa: There have not been any confirmed raids in the Bay Area, but we are expecting they will come. Trump talked a lot about San Francisco’s alleged protection of “undocumented criminals” throughout his campaign. We are on high alert in the Bay Area. It has to be a Day Without Immigrants, but also a Day Without Workers. The unions need to organize strike actions, mass sick-outs, and other actions. Everyone in the Bay Area must be in motion. Students must organize walk-outs, teach-ins, mass civil disobedience. It cannot be business as usual. And we are organizing and getting prepared. Many different organizations are collaborating to make sure that anyone impacted gets immediate and full access to representation. There have been lots trainings, both of immigrant rights organizers and community supporters. We have the power to shut down production. United, we can demonstrate that the government — whether it was under Obama yesterday or under Trump today — does not represent us. Question: Tell us about preparations for May First in the Bay Area. Luisa: We have to unite in one solid fist, in an independent movement of resistance!